From Sickness to Health is a program dedicated to making you smile while at the same time teaching you biblically backed, scientific principles along the way. Each episode covers a different topic as we interview experts in a variety of fields. But there’s more. We don’t just tell you healthy principles, we allow “Sickness” to have his opportunity to show why being sick is the only way to live. Here’s an episode to get a feel for what the show is all about. Enjoy! Who doesn’t love a cold glass of milk with a few cookies? No one can deny that this is delicious. But this episode raises a different question: What happens physiologically when cow’s milk enters the body. With conclusive evidence from science and From Sickness to Health guest physicians, Dr. Jim Said, this program focuses on the many issues surrounding the use of whole cow’s milk and why we must choose from the abundance of healthier alternatives. Many believe that Type II Diabetes is a disease that is passed on entirely through genetics. Statements are often heard like: “’Sugar’ runs in my family. My momma had it, her momma had it and now it’s my turn”. However, this is only partly true. In this episode of From Sickness to Health, the common misconceptions about this growing epidemic are challenged as host Rico Hill and Dr. Milton Mills, Associate Director of Preventive Medicine with the Physicians Committee for Responsible Medicine (PCRM), offer the truth behind what really causes diabetes. Constipation. It is a subject that few enjoy talking about. After all, who likes sharing their personal, bathroom business? The fact that 80% of Americans suffer from constipation is reason enough to at least start the conversation. In this episode of From Sickness to Health, host Rico Hill is joined by Dr. Jim Said and Vera Onkoba, registered nurse to discuss what constipation is, what makes us constipated and why we should talk about it more and experience it a whole lot less. In a series of interviews during our Sickness-on-the-Street segment, it was determined that people had no clue that there are clean and unclean foods. According to the Bible, there is a reason why people should not eat pork and shellfish. In this From Sickness to Health episode, Dr. Milton Mills returns to the studio with host Rico Hill to share the reasons behind the Bible’s prohibition of unclean foods. There are certain things that just baffle the mind. Here’s one: why would people consider someone who shows up unannounced, causes pain and only offers one good benefit – he let’s you know when it’s about to rain. Furthermore, why would anyone feed this kind of individual and consider him close enough to be called “friend” or “uncle”. Well, it turns out that this is exactly how the dreaded inflammatory disease arthritis is embraced. Dr. Jim Said sits down with Rico Hill and that arthritis is no friend or relative and would quietly go away if we would only stop feeding it. Would you believe that many people are more inclined to think that their heart attacks them when they have a heart attack? The truth is that their heart has been under constant attack for many years, due to smoking, diet and lifestyle and they are completely unaware. In this From Sickness to Health episode, Rico Hill is joined by Cardiologist Dr. Schubert Palmer who explains just what happens when the human heart finally reacts to the treatment it has received and what invasive measures he, as a surgeon, has to perform to save lives nearly everyday of his practice. The Best Part of Waking Up…Coffee? The world loves coffee. Coffee is one of the world’s most valued traded commodity, second only to oil. With coffee shops across from coffee shops, it appears that the supply can barely keep up with the demand. But at what cost to the human body do we indulge ourselves for this coveted caffeine fix? Dr. Jim Said brings many unnoticed facts to the discussion of this episode of From Sickness to Health, clearly demonstrating that there is more to this dark brew than the quick pick-me-up experienced in the morning. A pill for this and a pill for that… Recent reports show that we are living in an over-medicated society. In fact, 70% of Americans are taking drug medications. Twenty percent of them are taking 5 or more. Often drugs are taken for lifestyle diseases like high blood pressure and high cholesterol, when studies have shown that lifestyle changes can bring blood pressure and cholesterol levels under control. This episode features Dr. Jim Said who joins host Rico Hill to discuss a new and better prescription for our health. Is Red Meat Really Red? From Sickness to Health’s nemesis, the Blue Guy, suggests from the very top of this program that red meat is not actually red. He further establishes in his Sickness-on-the-Street segment that people love their steaks whether they are red or dark brown. But recent studies have shown that red meat shortens one’s life, sometimes by 10 years. Clearing up any confusion, From Sickness to Health host Rico Hill is joined by Dr. Milton Mills who shares from his preventative health perspective the details of recent studies on the dangers of red meat and why we ignore them. Is the sun a friend or an enemy? While most enjoy time in the sun, it is not without fear and trepidation. Often toxic sunscreens dominate our outdoor experiences for fear that we’ll subject our bodies to skin cancer. A good measure of caution is healthy, but how can something we love so much be so feared? In this episode of From Sickness to Health, we explore the health benefits of sunshine and the beautiful parallels of our need for both the S.U.N. and the S.O.N. Where’s the Rest of my Sleep? There are so many who underestimate the value of proper rest, pulling the occasional “all nighter” and then boasting of it as if it warranted merit and applause. Then there are many who sleep, but don’t rest, not knowing the difference between the two. This episode looks at why it is essential to our well being to experience refreshing rest and highlights all of the health-activating physiological processes that take place while the body is in a state or rest. 20th Century comedian W.C. Fields once stated: “I never drink water. I’m afraid it will become habit-forming.” Sadly, he chose a different liquid. But how many are sharing this sentiment when the choice is made to drink sodas and other beverages over water? 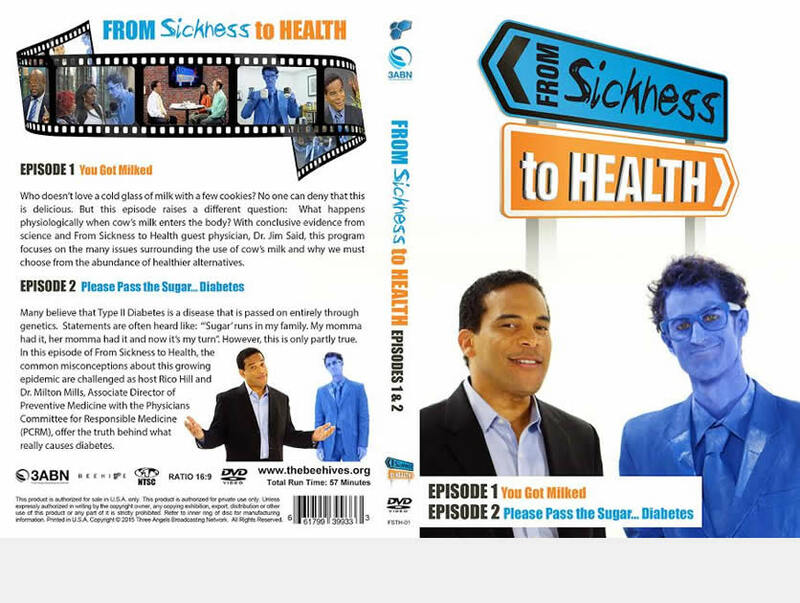 From Sickness to Health looks at how valuable water is to the human body, which is 70-75% water. Could it be that with this large percentage that our body is telling us what we actually need?